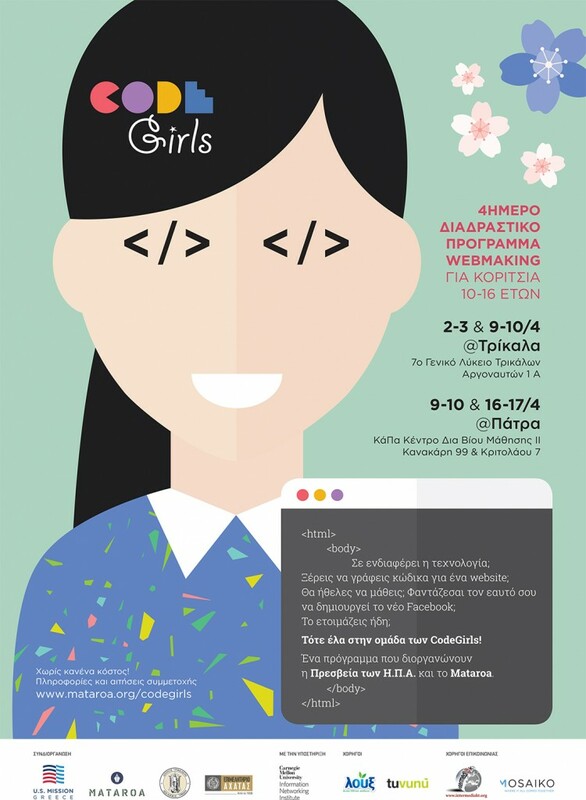 InterMedi@KT supports the first Patras CodeGirls! The U.S. Mission to Greece and the Greek NGO Mataroa are partnering with the Municipality of Trikala and the Achaia Chamber of Commerce to sponsor a one-of-a-kind, innovative coding program for Greek girls between 10 and 16 years of age. In an attempt to close the gender gap in the technology and engineering sectors, this program, currently in its second year, aspires to educate, inspire, and equip high school girls with the skills and resources to pursue opportunities in computing fields. The secrets and the future of new technologies. The four-day program will be held April 2-3 & 9-10 in Trikala; and April 9-10 & 16-17 in Patras. Participation to the program is free and will be on a first come, first served basis, as spaces are limited. Pre-registration is required. The ideal CodeGirl candidate is goal-oriented and passionate about technology. She does not need previous experience in computing or any specialization in mathematics. The aim is a group comprised of girls with different levels of experience and varied interests.